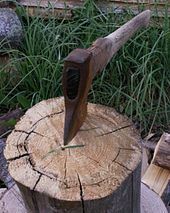 An axe (sometimes ax in American English; see spelling differences) is an implement that has been used for millennia to shape, split and cut wood, to harvest timber, as a weapon, and as a ceremonial or heraldic symbol. 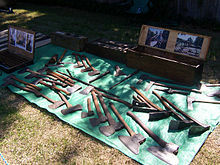 The axe has many forms and specialised uses but generally consists of an axe head with a handle, or helve. 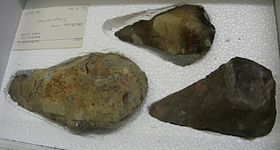 Initially axes were tools of stone called hand axes, used without handles (hafts), and had knapped (chipped) cutting edges of flint or other stone. Stone axes made with ground cutting edges were first developed sometime in the late Pleistocene in Australia, where ground-edge axe fragments from sites in Arnhem Land date back at least 44,000 years; ground-edge axes were later invented independently in Japan sometime around 38,000 BP, and are known from several Upper Palaeolithic sites on the islands of Honshu and Kyushu. In Europe, however, the innovation of ground edges occurred much later, in the Neolithic period ending 4,000 to 2,000 BC. 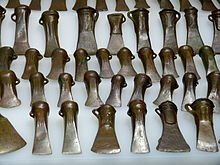 The first true hafted axes are known from the Mesolithic period (c. 6000 BC). Few wooden hafts have been found from this period, but it seems that the axe was normally hafted by wedging. 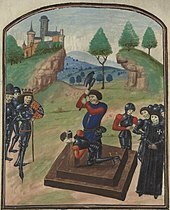 Birch-tar and raw-hide lashings were used to fix the blade. Stone axes are still produced and in use today in parts of Papua, Indonesia. The Mount Hagen area of Papua New Guinea was an important production centre. 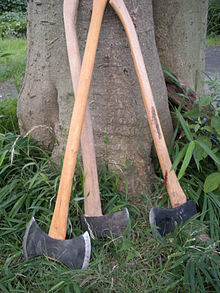 The Proto-Indo-European word for "axe" may have been *pelek'u- (Greek pelekus πέλεκυς, Sanskrit parashu, see also Parashurama), but the word was probably a loan, or a Neolithic wanderwort, ultimately related to Sumerian balag, Akkadian pilaku-. In Minoan Crete, the double axe (labrys) had a special significance, used by priestesses in religious ceremonies. The symbol refers to deification ceremonies; part of the leaping over the bull symbol also found at Crete; whereby aspirant becomes able to speak as a god to create any reality; the symbol being a sky map. Dane axe: A long-handled weapon with a large flat blade, often attributed to the Norsemen. 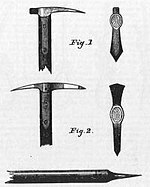 Pulaski: An axe with a mattock blade built into the rear of the main axe blade, used for digging ('grubbing out') through and around roots as well as chopping. The pulaski is an indispensable tool used in fighting forest fires, as well as trail-building, brush clearance and similar functions. Splitting maul: A splitting implement that has evolved from the simple "wedge" design to more complex designs. 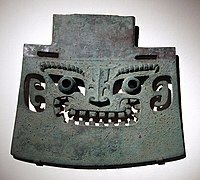 Some mauls have a conical "axehead"; compound mauls have swivelling "sub-wedges", among other types; others have a heavy wedge-shaped head, with a sledgehammer face opposite. ^ Takashi, T. (2012). "MIS3 edge-ground axes and the arrival of the first Homo sapiens in the Japanese archipelago". Quaternary International. 248: 70–78. doi:10.1016/j.quaint.2011.01.030. ^ Johan David. "Notes sur trois outils anciens du charpentier : le bondax, la bisaiguë, le piochon" Archived 28 October 2011 at the Wayback Machine, Revue des archéologues et historiens d'art de Louvain 10. 1977. ^ Farlex. "Lathing hammer". The Free Dictionary. "Axe" . Encyclopedia Americana. 1920. "Axe" . New International Encyclopedia. 1905. "Axe" . The American Cyclopædia. 1879. "Axe" . Encyclopædia Britannica (11th ed.). 1911.